Saturday, August 11, 4:00–5:30pm, Collins Library, Pacific NW Room – hors d’oeuvres will be served. Sunday, September 23, 2018: Open Cases: co-sponsored by the Puget Sound Book Artists, 2:00–4:00pm, Collins Library. A unique chance to handle the books and see the illustrations. Wednesday, October 3, 2018, Sketch In with the Artist, 10:00am – 3:00pm, Collins Library. Mark Hoppmann will be demonstrating sketching, in collaboration with the Slater Museum. He will be sketching from museum specimens of local wildlife that has inspired his recent work in A Garden of Earthly Delights. Everyone is welcome to bring in their own sketchbooks and join in the fun. 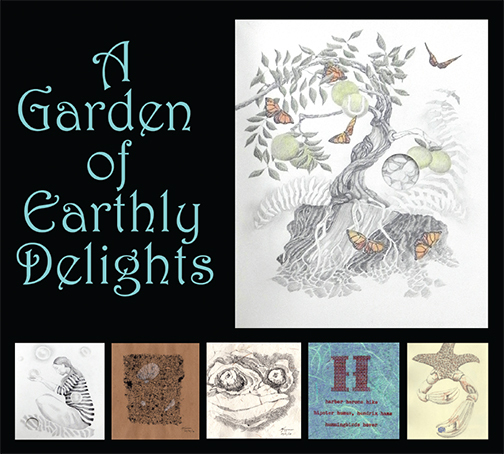 Partially funded by a Tacoma Artist Initiative Project (TAIP) grant from the Tacoma Arts Commission, The Garden of Earthly Delights is an exhibition of nine new works by Tacoma book artist and illustrator, Mark Hoppmann. See if you can translate the cryptic text of Coptic bound, Tacoma Codex I, a handwritten and illustrated manuscript transcribed in a new alphabet inspired by the decaying wharfs of Tacoma’s seafaring past. Explore the strange collection of images found in A Garden of Earthly Delights which Hieronymus Bosch might have used in his masterpiece, had he lived in the present day Pacific Northwest. In addition to alliterative haiku in Northwest Aliterations, a collection of sketches titled Gargoyles, and other new works, the exhibition will also include previous works and many of the artist’s past and current sketchbooks, studies, and tools, all of which challenge the viewer’s perceptions of the Pacific Northwest and the art of the book. Mark Hoppmann graduated from Drake University with a BFA in graphic Design and Commercial Art in addition to studying art for one year in Florence Italy. After working for twenty years in the graphic arts industry as an offset pressman, prepress and bindery operator, he resumed his art career and has been an artist in Tacoma Washington, working primarily as a book artist, illustrator, and watercolor painter for the last twenty years. He says, I have always been curious. That curiosity has resulted in an eclectic accumulation of bric-a-brac, memories, experiences, and books, all which in turn, inspire my art. With apologies to Rudyard Kipling, my intent is to design illustrated books for those, “with ‘satiable curtiosity.” Simple and sometimes unadorned, but thoughtfully creative book designs hide a treasury of illustrations within.